The human heart has the unique property of generating its own rhythm of contraction. This rhythm originates in the sinoatrial node located in the atrium of the heart. The impulses generated in the sinoatrial node travel via the conductive tissue of the heart from the upper chambers to the lower chambers ultimately resulting in a well-orchestrated contraction of the atria followed by that of the ventricles. When the atria contract the blood flows from upper chambers to the lower chambers. Ventricular contraction causes the blood to flow from the lower chambers to the aorta and then to the whole body. In healthy individuals, the heart beats at an average rate of 70-90 beats per minute. But in heart patients, the rhythm of the heart is disturbed. The atria and the ventricles contract at different rates and in an unsynchronised fashion which can lead to cardiac arrest. Irregularities in the heart rate require intervention in the form of cardioversion or defibrillation. This is a medical intervention used to normalize an abnormal heart rate that occurs in atrial flutter, atrial fibrillation or ventricular tachycardia. In these conditions the heart rate exceeds 100 bpm and is irregular. The condition can be episodic and indicates an underlying heart condition such as hypertension, cardiomyopathy etc. Electrical cardioversion refers to administration of therapeutic dosage of electric current in a specific moment of the cardiac cycle. The timing is important to avoid ventricular tachycardia. This is a scheduled procedure performed on an out-patient basis on patients who have a history of episodic atrial flutter or atrial fibrillations. Electric current is administered using pads that are placed on the chest or on the chest and back. They are held in place with the help of saline based gel. The cables are connected to machine that generates shocks and displays the cardiac rhythm. The patient is given sedatives to make the entire procedure more tolerable. Electrical Cardioversion can at times be used as a lifesaving intervention in emergencies like ventricular tachycardia. Pharmacological cardioversion entails the use of antiarrhythmic drugs to restore normal heart rate. Sodium channel blockers, beta blockers, potassium channel blockers or calcium channel blockers are the drugs used. All these drugs act to reduce the conductivity of the heart muscle which in turn reduces the heart rate. This is a good alternate in patients with fibrillation of recent onset. This is an emergency resuscitative procedure in which therapeutic doses of high energy electrical shocks are given to patients to restore heart beat in cardiac arrest or pulseless ventricular tachycardia. They can be administered at any time in the cardiac cycle. Automated external defibrillators generally found in public places like airports, bus station, railway stations, offices etc. are designed to analyse the disturbed heart rate and administer shocks accordingly. These can be operated by untrained personnel and cannot be manually overridden. The only drawback is that they take around 10-20 seconds to analyse the rhythm which can be critical. Semi-automated external defibrillators are similar except that they can be controlled manually when operated by a trained paramedic. They can pace the heart rate. These machines have an ECG display which helps in resuscitation. Internal defibrillators are seen in the operation rooms where they are used to restore heart beat during an open heart surgery. The paddles are placed above and below the heart and the shock is given. Automatic internal cardiac defibrillator (AICD) is implanted under the skin in the chest area. They constantly monitor the rhythm of the heart. Upon sensing any irregularities in the rhythm, it immediately sends shocks to the heart muscles and restores normal heart rate. To summarize cardioversion and defibrillation both restore normal heart rate with defibrillation being the procedure of choice in a cardiac emergency. Maitreyi Naigaonkar. 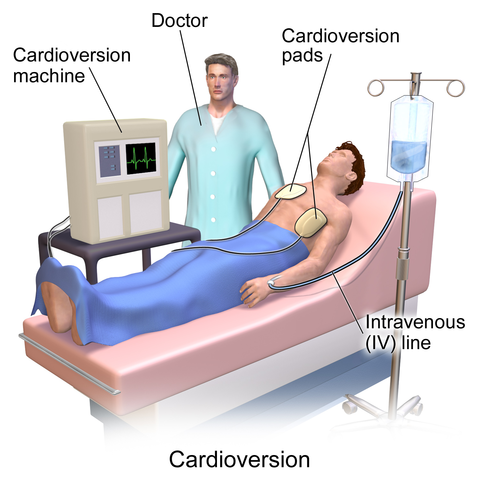 "Difference Between Cardioversion And Defibrillation." DifferenceBetween.net. February 11, 2015 < http://www.differencebetween.net/science/health/difference-between-cardioversion-and-defibrillation/ >.